Davis, CA, 7th grade – I was on the school basketball team, and usually played a two guard or small forward. In the 4th quarter of a game that wasn’t close, the coach told me to go in and run point. The other four players on the court, all white, weren’t having it. The coach didn’t intervene. Maybe that story doesn’t play out the same way now? Vice President Joe Biden (who I like to think of as America’s wacky, slightly off-color Uncle Joe) briefly imitated an Indian accent while giving a speech in New Hampshire on Thursday. 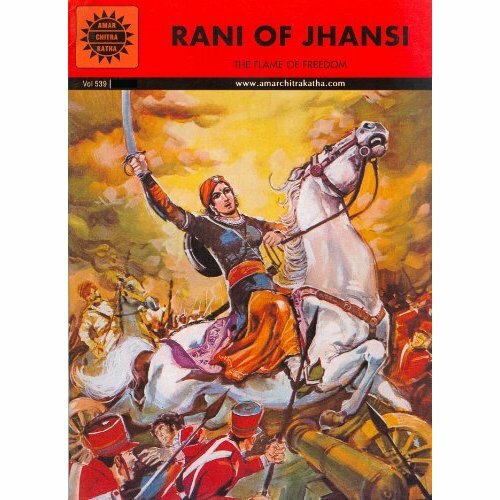 Almost a year after the passing of the Father of Indian comics Anant Pai, the Asian American Writers’ Workshop pays tribute in New York on February 16 to the comic series he created. Amar Chitra Katha: Monica Ferrell, Chitra Ganesh, Keshni Kashyap, and Himanshu “Heems” Suri of Das Racist Does your knowledge about the Ramayana come entirely from comics your mom brought you from Jackson Heights? Or are you a comic book fan interested in engaging with one of the bestselling comics in both Asia and the world? Party down with the Workshop’s tribute to Amar Chitra Katha, the beloved Indian comic that’s sold more than 90 million copies, often featuring lovelorn maidens, fearless saints, and mythical kings romping around a half-toned South Asian fantasia, tinted yellow, blue and green. I’ve read the Ramayana and enjoyed the comic versions too. 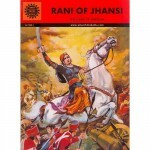 I’ll also admit that much of my knowledge of the Bible comes from the colorful, engaging Amar Chitra Katha comics. For more details on the event, visit aaww.org. Marie Claire Magazine titles its interview with South Carolina’s governor “Will Nikki Haley Be Our First Female President?” and looks at her tips for personal success and her inspirations. That’s how we get to know she’s totally into Joan Jett. I wonder if she watched The Runaways when it came out in theaters a couple years ago or if she has a vintage collection of Jett LPs. The police are not releasing video surveillance of the event yet, and they say that the video does not show a Taser being used but does show two women walking past the victim and then passing her again as if targeting her. They will determine if it’s a hate crime after finding and interviewing the suspects, and are also pursuing a theory that it was an attempted robbery. Four locations in Queens rang in the first night of the new year with firebombs. An Islamic center, a bodega, a home used for Hindu worship, and the home of an African-American Christian family had firebombs thrown at them. A fifth location in Nassau County, the home of a desi family, was also targeted with a firebomb. No people were hurt in the attacks, and the NYT mentions that in three of the attacks the bombs used Starbucks Frappucino bottles. This morning New York religious and community leaders will hold a press conference to denounce the attacks at Imam Al-Khoei, the Islamic center targeted by one of the firebombs. The state’s governor and NYC’s mayor have both spoken out against the attacks. 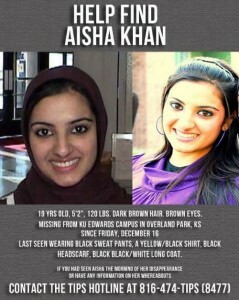 UPDATED Dec 21, 2011: Looks like Aisha Khan was found and that some of you skeptical commentators were right all along. We will keep you posted as the story develops. Are you in Kansas? Pay attention to this photo. Her name is Aisha Khan and she’s missing. I can’t shake the chills her story gives me. She’s petite, 19 yrs old, newly wed and a college student. Her sister dropped Aisha off at 10am on her college campus so that she could prep for her noon final. But she never made it to her final. Aisha Khan … has been missing since Friday morning. That is when her older sister said she left frantic text messages with her about a drunken man on the Edwards Campus she described as “creepy.” Faiza Khan said she dropped Aisha off at the campus around 10 a.m. Friday ahead of a noon final. The text messages started arriving within an hour. I can’t count how many times I’ve been creeped out by harassing men – it often feels that as a woman in the American public we have to brace ourselves for street harassment. But Aisha is a girl in hijab – I can only imagine that her harasser must have said something really islamophobic and sexist to have deserved a slap. Finally, there’s the voicemail message she left her sister. The NFL has its first minority owner and he happens to be a Pakistani-American. 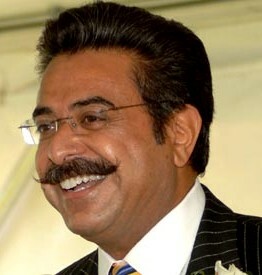 Shahid Khan, an Illinois businessman who owns the Flex-N-Gate Group, which makes automobile parts, is paying a reported $760 million to buy 100 percent of the Jacksonville Jaguars from Wayne Weaver. Yes, you’re going to see a brown man with a handlebar mustache giving high-fives in the owner’s box. How cool is that? Khan, 61, came to America when he was 16, earned an engineering degree from the University of Illinois and fell in love with American football and a blonde named Ann Carlson. 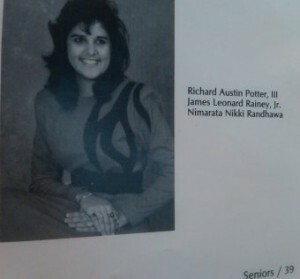 Over the years, Khan and his wife have given zillions to their alma mater. The big question hanging in the air in Jacksonville is whether Khan will keep the team in the city or try to move it to L.A. So far, Khan is saying all the right things, but will he be able to resist the hundreds of millions he could make by moving to a much larger market? It will also be interesting to see whether Khan keeps a low profile or seeks the limelight. Will he be the type of owner who’s on the sidelines, chatting with players, and always ready to make comments to the media? Or will he stay in the background and let his coach and general manager run the show? If he enjoys being in the news, then you can bet that L.A. will be very tempting. There are two million South Asian Americans – at least those were the numbers we had to use and were derived from the 2000 Census. But as we’ve written before, the numbers of the community were suspected as being underestimated in the previous Censuses. 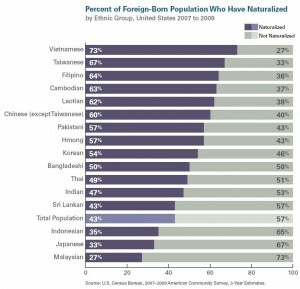 The data from the 2010 Census has been slowly release this year and last month the Asian Pacific American Legal Center released their latest report “A Community of Contrasts; Asian Americans in the United States: 2011″ (download PDF here) which has a comprehensive national community analysis. The report covers a wide range of topics such immigration, employment, housing and health. I would like to address in particular the population and civic engagement components that the report discovered in the South Asian community. One of the largest findings is that South Asians are the fastest growing Asian American community; the Indian population is at 3,183,063; the Pakistani population is at 409,163; Bangladeshi population at 147,300; Nepalese population at 59,490; Sri Lankan population at 45,381; and Bhutanese population at 19,439. That brings the South Asian American population close to 4 million with an exact total of 3,863,836 people. 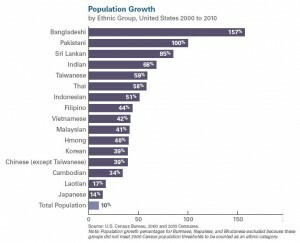 The Bangladeshi and Pakistani population literally doubled between 2000 and 2010.